Happy hour devotees searching for “five o’clock somewhere” can find it anywhere and anytime in Atlantic City. Day or night, visitors can unwind in upscale casino bars with sweeping views or casual local spots. 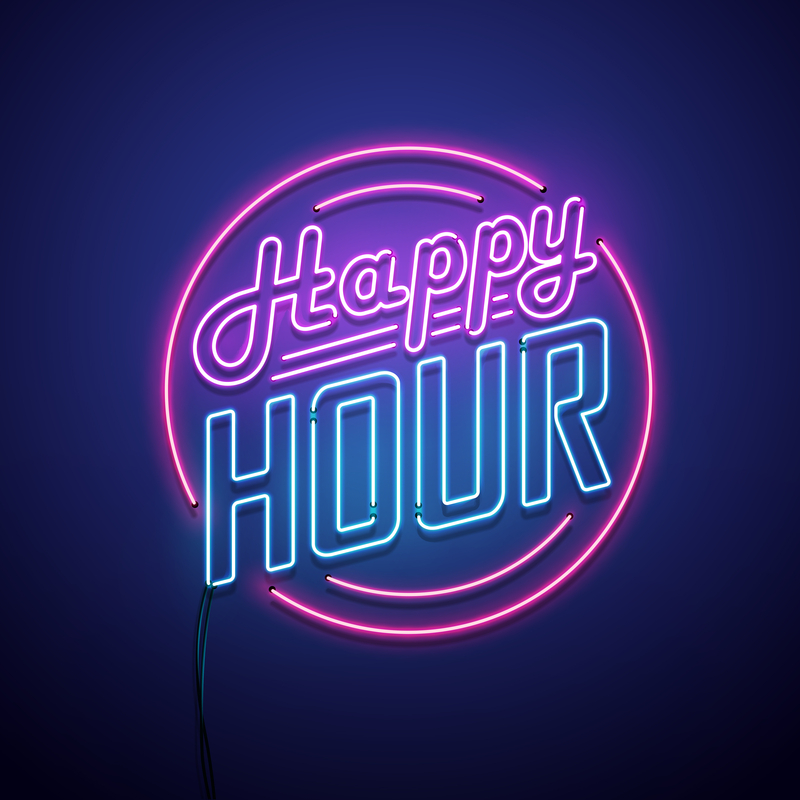 Because there’s no such thing as too much of a good thing, a number of establishments offer happy hour specials throughout the day into the wee hours of the morning. “Power Hour” at Morton’s Steakhouse at Caesars is happy hour done right! From 4:45 PM to 6:30 PM and 9:00 to close, choose from the restaurant’s Bar Bites menu with petite filet mignon sandwiches, short rib steak tacos, shishito peppers and other favorites ranging from $7 to $9. Drink specials start at $5.50. You can catch happy hour Sunday - Friday. Scrumptious happy hour delights await you every day at McCormick & Schmick’s located inside Harrah’s. A selection of $3 snacks, $5 munchies, $7 goodies and $9 bites will no doubt sate any appetite. Be sure to top it off with a cold section of local and craft beers, spirits, wine or a hand-crafted cocktail or martini. Happy hour takes place 4:00 PM to 7:00PM (Monday - Friday) and Noon to 5:00 PM (Saturday & Sunday). Ocean Resort Casino is the gathering spot for all ages and styles. Distrito Cantina: 5 Margarita Mondays $5 all day! Margaritas, clasico, spicy, sparkling, cranberry, strawberry and cucumber $5; Nachos, Chips & Salsa $5; Cervezas bottles & drafts starting at $6. Amana Sunset Happy Hour: Thursday, Friday and Sunday from 5pm-7pm. Enjoy Sangria, wine and specialty cocktails starting at $8, draft beers $5 and tapas plates starting at $6. The Den and Sports Bar: Everyday $4 craft beers. Gallagher’s Burger Bar at Resorts Casino Hotel offers happy hour specials Sunday - Friday (Noon to 6:00 PM) with your choice of $3 select beers, $4 sangria and $5 select wines and cocktails. Whiskey Five Bar - Happy hour Friday-Saturday 5pm-8pm. Enjoy $5 NJ beers and wines and $6 whiskey of the week. Bar Olon - Happy hour daily from 4pm-7pm. Food specials include rotating $3 Especialidades, and $5 guacamole made with avocado, roasted jalapeno and cotja cheese served with Taro chips. Enjoy $3 draft and bottle beers along with $4 sangria and $5 wines. Tango's Lounge - Every Sunday - Thursday from 3pm-7pm. $4 select drafts; $5 Domestic bottle beer; $6 imported bottle beer; $6 select wines; $7 select cocktails. Boogie Nights - Thursday night Happy Hour from 10pm-midnight enjoy $6 drinks specials and 1/2 price select liquor bottles. Carmine's - Happy Hour done big! Drink specials from $5 - $7, Monday - Friday 3pm-6pm. Cuba Libre Restaurant & Rum Bar - Be transported to old Havana with Cuba Libre's happy hour, week days from 5pm-7pm. Specials include $5 caipirinhas and house Cuba Libres; $4 house wine and sangria and $3 beer plus a grande tapas menu. Bonus: Friday & Saturday from 4-6pm pitchers of Mojito and sangria are offered at 1/2 price. Ri Ra Irish Pub - Happy hour is Sunday-Thursday from 3pm-6pm where you can enjoy $3.50 domestics, $4.50 house cocktails, and $5 glasses of house wines, plus food specials. Chickie's & Pete's - Boasting an all day happy hour, seven days a week. Domestic drafts starting at $3.50, select import drafts at $4.50 and liquor specials at $5. Broadway Burger Bar - Sunday-Friday from 3pm-7pm is happy our. $2 Bud Light draft; $3 select domestic beer; $4 select craft beer; $5 ultimate vodka; $5 Pyrat rum cocktails; $5 infused martinis, $5 select wines; $5 select shots; $6 roca Patron. The happy hour continues Friday-Saturday with late night features from 10:30pm - close. Casa Taco & Tequila Bar - Happy hour Monday - Friday, 1pm-7pm at the bar. Enjoy $3 single tacos; $6 nachos; $8 cheese quesadilla; $6 house Margaritas, $5 well drinks; $4 red or white sangria; $5 Budweiser, $5 Corona. A Dam Good Sports Bar - Where it's always happy hour! Daily specials include $3 PBR, Miller Hi Life drafts, $6 select martinis and of course $5 & $6.50 40oz beers. Anthem Lounge - stylish and Trendy, happy hour on Friday and Sunday from 11pm-midnight with $5 drink specials and 2 for 1 bottle service packages. Firewaters Saloon - For a laid back good time enjoy happy hour here. Monday - Friday 4pm-7pm get $6 long Islands and $2 Coors Lights, Budweiser, bud Light, Miller Lite, Yuengling, 16oz drafts and $5 house wines by the glass. The Sixty Café Bar & Lounge located inside the Flagship, offers daily happy hour specials beginning at 2:00 PM. There’s never a need to go thirsty with beers starting at $3, house mixed drinks for $4 and wine for $5 a glass. Bar bites such as spinach and artichoke dip, wings and hummus begin at $4. Not to be outdone, Blue Water Grille offers domestic and bottled beer starting at $4 with house mixed drinks and wine for $6. Leave room for your choice of cheesesteak egg rolls, caprese, popcorn shrimp or clam strips going for $5. Happy hour is daily from 5:00 to 7:00 PM. Did someone say margarita? It’s always a fiesta during happy hour at Mexico Restaurant & Bar with drink specials starting at $4, select beers starting at $2 and $5 appetizers consisting of nachos, flautas or quesadillas. Get your “happy” on Sunday - Friday (11:00 AM to 2:00 PM and 5:00 PM to 7:00 PM). Rainforest Café holds happy hour Monday - Friday (11:00 AM to 6:00 PM). Enjoy domestic bottles ($3), select drafts ($4), $5 well cocktails and an array of appetizers ranging from $6 to $8.